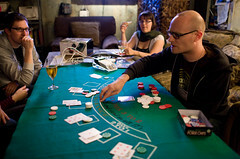 Perhaps you had not heard that there is such a thing as professional Blackjack teams. Well, let me tell you there are and they are groups of professional blackjack players that operate altogether employing advanced gaming techniques to create a positive expectation. Blackjack teams expect that for every $100 wagered, they will get a return that is greater than $100. Some of the techniques they use are card counting, shuffling tracking and hole carding. They may only bet on low stakes blackjack tables or they may pick the riskier bets. One of the biggest Blackjack teams out there is the MIT Blackjack Team. They were not the first to operate as a team but they are famous because they have been operating together for over 12 years. The group was formed after the university held a mini-course called “How to Gamble if You Must” and JP Massar was absolutely fascinated by it and decided to start the team. At first, he was not very successful as a gambler but in 1980 he met Bill Kaplan, who had been running a successful Blackjack team for three years in Las Vegas. Kaplan became MIT’s team advisor and fixed some fundamental mistakes they were making, which was mainly using wrong card counting techniques. The conditions to form the MIT Blackjack Team were that the team would have formal management procedures, a dedicated card counting and betting system, strict training, player approval processes and meticulous tracking of all casino play. The team was formally established on August 1st, 1980 and they invested $89,000 and gathered 10 players. The members managed to earn about $80 per hour and they got an annualized return of 250% of their investment. By 1989 the team had 70 active members but it was then when everyone began to lose interest. As years went by it became more difficult to manage the team and to get new members, original founders Massar and Kaplan tried to restructure the team renaming it Strategic Investments. However, casinos around the US started banning players in the team after figuring out their techniques and the team was dismantled on Dcember 31st, 1993. Everyone has noticed that when you play Blackjack against the house, the odds are in favor of the house even if you assume yourself an expert player due to fact that normally casino uses a 6 card deck. Though there are some certain actions that you can do if you want to increase your chances against your dealer. The most important thing you need to know whether you play in offline or online casino is to find a table where the minimum bet is affordable. There isn’t any problem while playing in an online casino where blackjack begins as low as $0.10 while in real casinos normally the minimum bet is $5. Another important characteristic on blackjack is splitting. You should always split Aces, eights and nines while you shouldn’t split five’s or four’s. Splitting, as well doubling should be used carefully as it cast cost you a lot of money. Normally it is famous that Blackjack is a game of skill but you shouldn’t spoil the fun you can get by wagering large amounts of money that you cannot pay for. Therefore it’s recommended that it if you really want to become a skillful blackjack player, then start practicing on free online casino rooms to polish your gaming skills and then switch to real cash on online casinos to try your luck under real conditions. Play Online BlackJack at TheVirtualCasino Now!